The precursor to the current line of (transparent) tapes was developed in the 1930s by inventor Richard Drew. Although it is a trademarked brand name, it is often improperly used in the U.S. as a generic term for any transparent adhesive tape. Use of the term “Scotch” in the name has a rather pejorative origin. In order to cut production costs, 3M attached the adhesive only to the edges of the tape. A remark was made that the stingy Scotch bosses need to put more adhesive on it – the name has stuck ever since. A Dorset granny’s apple tree could be a unique variety that is over 200 years old. Diana Toms has been making pies from an apple tree in her garden all her life. The crop from the tree was always known as ‘Granfer’s apples’. It was named after 83-year-old Diana’s great, great grandfather who planted it around 1803 when he bought the house in Beaminster. Scientists are still trying to identify the apple but say it could be older than the Bramley, which was discovered between 1807 and 1814. My Grandmother had an apple tree that bore wonderfully sweet and crunchy apples of an unknown (to me anyway) variety. Sort of pink with a vertical banding of darker red, almost round in shape. Likely planted around 1920 0r 1930. January 30, 2007 Posted by oldstersview | Uncategorized	| Comments Off on Granny’s tree — yum! A farmer whose cows produced pink milk after eating carrots got them to produce normal coloured milk by feeding them white carrots instead. Peter Houguez from Jersey added carrots to the cows diet of grass and hay. After the milk turned pink Mr Houguez contacted his local vet who told him to feed them white carrots, imported from France. January 30, 2007 Posted by oldstersview | Uncategorized	| Comments Off on Pink milk? A Chinese man had to have his contact lenses surgically removed after he did not take them out for a year. Liu, 40, started to wear contact lenses a year ago and never took them out because he found it difficult. 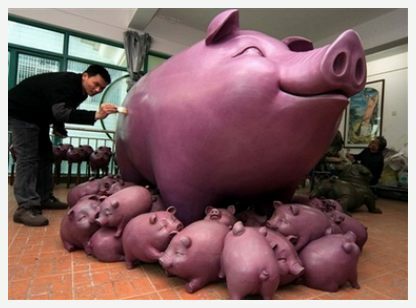 “I only have some eye drops for when they feel uncomfortable,” he told Chutian City News. Liu recently felt his eyesight was getting worse, so he bought another pair of lenses and wore them on top of the old ones. But when his eyesight still didn’t improve, he took another startling decision. “I put a pair of used disposal contact lenses over the other two pairs in my eyes. By then, I was wearing three pairs of lenses,” he said. By the next day, Liu’s eyes had reacted badly to his DIY eyecare and he finally sought medical attention. A doctor was shocked to find the first lenses had grown into his eyes and surgery was needed to take them out. She plans to keep working? Right. A Cheshire woman has won nearly £500,000 from a £2 bet. Agnes Haddock, who runs a washing and ironing business, chose all six Tote Scoop6 TV jackpot winners. She has a chance of picking up a £248,288 bonus if she picks the winner of a race still to be nominated next Saturday at Sandown. But Agnes plans to keep on working at her firm in Northwich, Cheshire, reports the Sun. January 30, 2007 Posted by oldstersview | Uncategorized	| Comments Off on She plans to keep working? Right. An Alaskan eagle trying to carry off a deer’s head apparently flew into a power transmission line near Juneau, Alaska. Result? One dead eagle and 10,000 people without power. Scott Horrell owns the 9 Lb. Hammer bar in Georgetown, and in November he had had it: Two dogs — on the same night — did their business on the floor. Barry Rogel, owner of the Deluxe Bar & Grill on Capitol Hill, said enough after a woman walked in last summer with a pet duck. 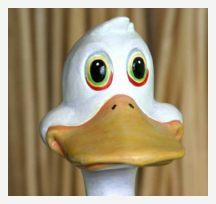 And it wasn’t even a service duck. He put up a sign saying no pets allowed, except for service dogs.To be sure, Seattle remains a pet-friendly town, where restaurant, cafe and bar staff wink at a state health law prohibiting pets, except service animals, in establishments where there’s food. And though it’s a little early call it a backlash from the proliferation of dogs — or duck, in at least one case — more no-pets signs appear to have gone up around Seattle over the past few months. Clenzo Thompson really should get a new career. The bird-brained bandit was busted for sticking up the same Brooklyn bank twice in three days – and having a dye pack explode in his face both times, cops said. And this is three years after he robbed another bank but dropped his state ID card while pocketing the cash, sources said. International Alchemy Conference – Ummm, Right. · Discover the secret history of alchemy and how it is practiced today. · Learn the secret formulae and processes of the alchemists. · Learn how to set up an alchemical laboratory in your own home. · Be able to recognize hidden “signatures” of people and events. 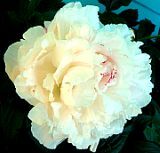 · Learn to make tinctures and elixirs that capture spiritual energy. January 29, 2007 Posted by oldstersview | Uncategorized	| Comments Off on International Alchemy Conference – Ummm, Right. Police were called in after a cat tried to pull a mouse out of a jam jar and got its head stuck. Officers said the incident was reminiscent of a Tom and Jerry cartoon, reports the Peterborough Evening Telegraph. A motorist went to a police station for help after finding the cat wandering beside a road in Peterborough, with the jar on its head and the mouse millimetres from its nose. A receptionist and three officers pulled and twisted but were unable to release the cat. Eventually the animal freed itself – and the mouse – by smashing the jar on the floor of Thorpe Wood police station. A woman who asked for her bank statement was sent financial details of 75,000 other customers too. Stephanie McLaughlan, 22, received five packages from Halifax Bank of Scotland, each containing 500 sheets crammed with confidential information. Each page details 30 customers’ names, their account and sort code numbers and how much they have paid in and out. The bank says it is “launching an immediate inquiry.” Good plan. An angry husband who threw old clothes into the garden and set fire to them because he couldn’t find any clean underpants accidentally burnt his home down. Ivo Jerbic, 55, from Prikraj, near Zagreb, told police he had lost his temper after failing to find any clean underpants in a closet full of old clothes. He had thrown them all in the garden and set fire to them. He told police: “My wife never throws anything out, I just lost my temper.” But the fire spread to the house which burned to the ground. Local news agency Hina reported that Jerbic could end up in jail for up to eight years for putting other family members in danger, even though no one was injured. January 29, 2007 Posted by oldstersview | Uncategorized	| Comments Off on Hot pants? Contour Crafting (CC) is basically a “house printer;” when supplied with the proper instructions, it will “print out” a complete shell of a house. 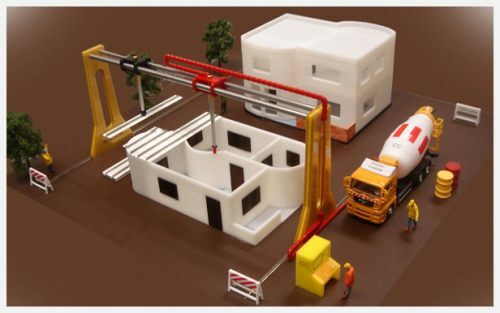 Technovelgy readers should be familiar with the work of Dr. Behrokh Khoshnevis from a previous article (see Contour Crafting: 3D House Printer for additional details on how the technique actually works). According to a recent article in the TimesOnLine, a UK news site, Dr. Khoshnevis’ Contour Crafting techniques will receive their first real world test in Los Angeles sometime in April of this year. The first prototype will be a watertight shell of a two-story house built in 24 hours – without a single construction worker on the job site. Headline: “Man pulls car with ears” Why? Shrug. 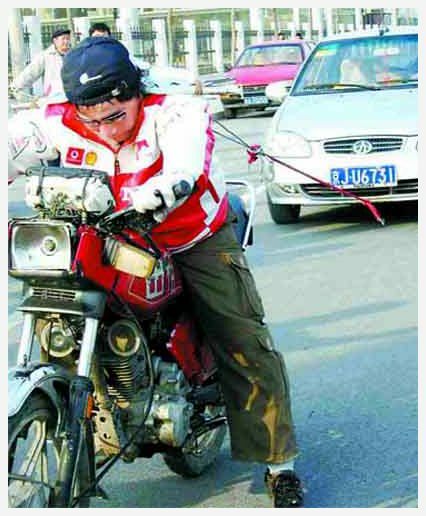 A Chinese man has pulled a car for more than 200 metres – with his ears – while riding a motorbike. Wang Lianhai, 36, from Qiqihaer city, demonstrated the stunt in a street in Beijing. With his ears attached to metal clamps, in turn connected to steel wires, he pulled the 1.2 tonne car with a driver sitting inside. After several failed attempts, Wang reportedly gave a loud cry and drove the motorbike slowly forward, stopping only at the end of the street. “Although by foot its more safe, I prefer to pull the car using a motorbike, which requires more skill,” he said. Wang said he had been working on the stunt since childhood when he had been “very naughty and eager to try new things”. His next ambition is to pull a ship, reports the Beijing Evening News. January 28, 2007 Posted by oldstersview | Uncategorized	| Comments Off on Headline: “Man pulls car with ears” Why? Shrug. In the first nine months of 2006, nearly 12 million Global Positioning System (GPS) devices were sold across the world, according to research firm Canalys. In 2007, this is forecast to more than double to nearly 28 million, with Europeans the most likely to want to know exactly where they are at any time. A [Virginia} man is facing felony drug distribution charges after an investigation that police said started after his brother used his MySpace Web page to boast of their homegrown marijuana crop and the frequency with which both men use marijuana, police said. Guard dogs protecting a fruit orchard in Malaysia have met their match — a 7.1-metre-long (23-ft-long) python that swallowed at least 11 hounds before it was finally discovered by villagers. 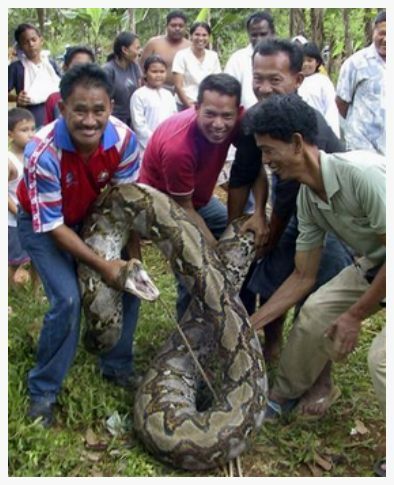 “I was shocked to see such a huge python,” orchard-keeper Ali Yusof told the New Straits Times in an article published beneath a picture of the captured snake, which was almost long enough to span the width of a tennis court and as thick as a tree trunk. January 27, 2007 Posted by oldstersview | Uncategorized	| Comments Off on Now THAT’S a snake! A drunk [North Dakota] man who tried to climb over a freight train stopped at a downtown crossing ended up going for a ride when the train took off. The 23-year-old man called 911 from his cell phone early Friday when the train reached the Casselton area west of Fargo because he was cold and wanted off, said Cass County Deputy Sheriff Shawn Getz. Dispatchers called BNSF Railway, which alerted the train conductor. “A few miles west of Casselton they were able to stop the train and the man got off,” Getz said. Authorities said the man did not require any medical treatment, and the railroad did not press charges. The man was taken to a detox center, Getz said. That cup of coffee just not getting it done anymore? How about a Buzz Donut or a Buzzed Bagel? That’s what Doctor Robert Bohannon, a Durham, North Carolina, molecular scientist, has come up with. Bohannon says he’s developed a way to add caffeine to baked goods, without the bitter taste of caffeine. Each piece of pastry is the equivalent of about two cups of coffee. 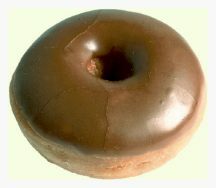 While the product is not on the market yet, Bohannon has approached some heavyweight companies, including Krispy Kreme, Dunkin’ Donuts and Starbucks about carrying it. January 26, 2007 Posted by oldstersview | Uncategorized	| Comments Off on Caffeinated doughnuts?